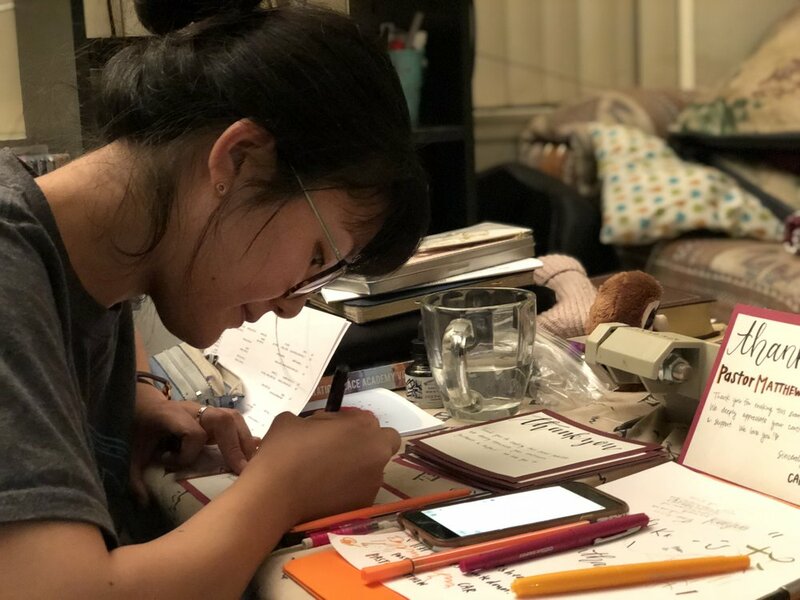 In our second story in the Alumni Series, we talked to Satomi Kikuchi, an alumna from California State University, Los Angeles (CSULA) and from CARP. She continues to support CARP after college as she plans for her career. Satomi Kikuchi reps CARP during Club Fair on CSULA campus. Satomi and the CSULA crew: Hitoe Hiraki (left), Sarah Takhar (middle back), and Jermaine Bishop (back right). I wasn’t so excited to be a part of CARP at first. As a student, I was very self-motivated and always strove to be the best academically. My mindset was that I was going to graduate as quickly as possible with the best grades possible and move onto pursuing my dream of becoming an occupational therapist as soon as possible. And, at first, I couldn’t see how CARP would fit into that plan I already had. My only motivation for being involved with CARP initially was to help out two of my good friends, Hitoe Hiraki and Jermaine Bishop, who were working hard to make CARP an official club at CSULA after they had transferred from Pasadena City College (PCC). CARP CSULA attends CARP LA’s evening program, Vision Night. As CARP CSULA grew bigger and I became more involved and had more opportunities to witness the impact CARP had on people’s lives, my perspective about it changed completely and my motivation for being involved became more personal. I saw so much beauty in the genuine relationships CARP students create among each other based on honest and open conversations about things that matter. I realized just how valuable it is to have a place where students can voice their own opinions about things such as faith, spirituality, worldviews, etc. in a safe place without being judged for it. CARP CSULA takes a group photo at the end of the Cypress Colloquium with their advisor. One of the biggest realizations I had this past year was the importance of the relationship between professors and students on campus. I had the opportunity to volunteer for and participate at this event called the Cypress Colloquium that CARP LA organized. Through preparing for and attending this event, I saw how crucial the relationship between professors and students, like that of parent and child, is in creating a more supportive, positive learning environment on our campuses today. Satomi spent extra time to prepare Thank You cards for the VIPs at the Colloquium. I thought back to my undergraduate years of not really communicating with my professors unless it was absolutely necessary and realized that I missed out on so many great opportunities to connect to my professors on a deeper level and inherit more from them. I can’t change what has already passed, but I can help others not make the same mistake I made. Satomi gives a CARP talk during a meeting. As an alumni, I can sincerely say that I am so grateful that I became involved with CARP and for all the valuable lessons I was able to gain and am still gaining today. Right now, I am working, saving up, and making preparations to attend a graduate program for a Master’s in Occupational Therapy. I enjoy working with people so whatever I end up doing in the future, as long as I can work directly with people, I'm happy. I am also still involved with CARP as part of the support staff, so I can now give back for all that I was able to receive as a CARP student. I am always in awe when I see just how much investment and sacrifice is made by the CARP leaders to put on all these events and talks for CARP, while also being students themselves. I hope to continue to do whatever I can, no matter how small, to support these amazing individuals. My advice for current students is connect with your professors! As long as you’re still a student, it’s never too late to start! Sit in the very front of the class, be on time, greet your professor when you walk in, visit them during office hours even if it’s to ask one question; even small things like this will make the biggest difference. The genuine relationships that you develop with your professors and fellow students are what will stick with you in life after graduation. Thank you, Satomi, for your love, support, and continued service! We wish you all the best in the future! Stay connected with CARP LA activities on their Facebook page. We are looking for more CARP stories! If you know someone or are someone who has a transformative story with CARP, send it to jennifer@carplife.org!